This name uses Spanish naming customs: the first or paternal family name is Benítez and the second or maternal family name is Maudes. Rafael Benítez Maudes (Spanish pronunciation: [rafaˈel ˈrafa βeˈniteθ ˈmauðes];[a] born 16 April 1960) is a Spanish professional football coach who is the manager of Premier League club Newcastle United. He is the only manager in history to have won the UEFA Europa League, UEFA Super Cup, UEFA Champions League and the FIFA Club World Cup. Benítez joined Real Madrid's coaching staff at the age of 26, going on to work as the under-19 and reserve team coach, and assistant manager for the senior team. Benítez moved away from Real Madrid in 1995, but management spells at Real Valladolid and Osasuna were short-lived and unsuccessful. Benítez guided Segunda División side Extremadura back to the Primera División in his first season in 1997, but the team was relegated the following season. He left the club, and coached Tenerife in 2000, winning promotion in his only season. Benítez was appointed coach of Valencia and won La Liga in the 2001–02 season. In 2004, another La Liga league title and a UEFA Cup victory were added building on the foundation laid by Héctor Cúper who had taken Valencia to two consecutive Champions League finals; in 2000 against Real Madrid, and in 2001 against Bayern Munich. After leaving Valencia, Benitez moved to English club Liverpool of the Premier League, guiding the club to victory in the UEFA Champions League in 2005. For the second consecutive season, he was named UEFA Manager of the Year. He also won the FA Cup in 2006 and reached the 2007 Champions League Final, but was unable to win the Premier League, with Liverpool's best league performance under Benítez a second-place finish in 2008–09. After leaving Liverpool in June 2010, Benítez was appointed manager of treble winning side Inter Milan. His reign at the club was a short one and he was dismissed midway through the 2010–11 season despite guiding the team to the Supercoppa Italiana and FIFA Club World Cup titles. In November 2012, he was appointed interim manager of Chelsea for the remainder of the season and he won the 2013 Europa League. Benítez returned to Italy in 2013 to coach Napoli, where he won the Coppa Italia and Supercoppa Italiana. He then left Napoli and became coach of Real Madrid in June 2015 on an initial three-year contract. It was another short-lived appointment and on 4 January 2016, he was dismissed following a 2–2 draw against his old club, Valencia. On 11 March 2016, Benítez was announced as the manager of Newcastle United in an attempt to save the club from relegation. Benítez was unable to avoid relegation, but earned promotion back to the Premier League the following year, winning the Championship. Benítez passed through the playing ranks as a midfielder for both Real Madrid Aficionados in the Tercera División and Castilla CF in the Segunda División. He also enrolled as a student at INEF, the sports faculty at the Universidad Politécnica de Madrid and in 1982 he obtained a degree in physical education. In 1979, Benítez was selected to play for the Spain Youth U-19s at the World Student Games in Mexico City and he scored a penalty in the opening game, a 10–0 win against Cuba. In the next game, a 0–0 draw against Canada, he was injured in a hard tackle. The injury saw him sidelined for a year and hampered his chances of becoming a major player. In 1981, Benítez joined Tercera División side Parla. Initially, he joined Parla on loan, but eventually signed for them permanently and helped them gain promotion to Segunda División B. He also played a further three games for the Spain Universities XI. In 1985, he signed for Segunda División B club Linares and under Enrique Mateos, he served as a player/coach. Further injury problems saw him miss almost the entire 1985–86 season and he subsequently retired as a player. In 1986, at the age of 26, Benítez returned to Real Madrid to join the club's coaching staff. At the start of the 1986–87 season, he was appointed coach of Castilla B. With this team, he won two league titles in 1987 and 1989. He won a third league title with Real Madrid Youth B in 1990. Halfway through the 1990–91 season he succeeded José Antonio Camacho as the coach of Real Madrid' under-19 club. With the team, he won the Spain Under 19s Cup in 1991 and 1993, defeating Barcelona in both finals. In 1993, the team completed a double when they also won the national under-19 league. While at Real, Benítez also gained his coaching certificate in 1989 and in the summer of 1990 taught at a football camp at the University of California, Davis, in California. During the 1992–93 season, Benítez also worked as an assistant coach to Mariano García Remón at Real Madrid B. After his success with the U19s, Benítez then succeeded García Remón at the start of the 1993–94 season. Real Madrid B were then playing in the Segunda División and on 4 September 1993, he made his debut as a Segunda División manager with a 3–1 over Hércules. In March 1994, he became assistant manager to Vicente del Bosque with the senior Real Madrid team before returning to coach Real Madrid B for the 1994–95 season. The first attempts by Benítez at senior management away from the Real Madrid fold were less than successful. He was appointed manager of Real Valladolid for the 1995–96 season, but was dismissed after only two wins in 23 games with the club bottom of the Primera División. During the 1996–97 season, Benítez took charge at Osasuna in the Segunda División, but after only nine games and one win, he was dismissed. He did, however, meet the fitness instructor Pako Ayestarán at the club, and went on to form a partnership with him at several clubs for the next decade. In 1997, he joined another Segunda División side, Extremadura, and this time led them to promotion, finishing second in the table behind Deportivo Alavés after winning 23 out of 42 games. Extremadura only survived one season in Primera División, however, and were relegated in 1999 after finishing 17th and losing a play-off to Rayo Vallecano. Benítez subsequently quit Extremadura and took a year off from football to study in England and Italy. He also worked as a commentator/analyst for Eurosport, Marca, El Mundo and local Madrid TV. In 2000, he was appointed manager of Tenerife of the Segunda División and with a team that included Mista, Curro Torres and Luis García, he gained promotion to La Liga by finishing third in the league behind Sevilla and Real Betis. In 2001, Benítez was appointed coach of Valencia, replacing Héctor Cúper. The club had previously approached Javier Irureta, Mané and Luis Aragonés and had been turned down by all three. However, Club Director Javier Subirats recognised the potential of Benítez and campaigned for his appointment. Valencia fans were soon won over by Benítez after he introduced a more attacking style of play than his predecessor, Cúper. He also brought in both Mista from his former club and Francisco Rufete from Málaga, with Mista going on to become top goalscorer for Valencia with 19 goals in the 2003–04 season. In 2002, these tactics saw Benítez lead Valencia to their first Liga title in 31 years, winning it by a seven-point margin over second-placed Deportivo La Coruña. However, the following 2002–03 season was a disappointing one—the club failed to follow up on their title success, finishing fifth in La Liga, 18 points behind champions Real Madrid. The season saw Benítez make his debut in the Champions League, where his side reached the quarter-finals, losing to Inter Milan. In 2003–04 season, Valencia won La Liga with three games to spare and beat Marseille 2–0 in the UEFA Cup final. Despite this success, Benítez fell out with Jesús García Pitarch, the club's director of football, over control of new signings and the club's failure to reinforce the squad with the players he wanted. He said, "I was hoping for a sofa [a defender] and they've brought me a lamp [Fabián Canobbio]," in reference to the positions he wanted to be strengthened. These differences of opinion saw Benítez resign as Valencia coach on 1 June 2004. On 16 June 2004, Benítez was appointed manager of Liverpool, becoming the first Spaniard to manage in the Premier League. One of Benítez's first tasks at Liverpool was to convince club captain Steven Gerrard not to move to rivals Chelsea. He was unable, however, to convince Michael Owen to extend his contract; he was subsequently sold to Real Madrid. Later in the summer transfer window, Benítez signed several players from La Liga, most notably Luis García and Xabi Alonso, both of whom drew immediate admiration from Kopites. Benítez also gave new life to existing Liverpool players, transforming Jamie Carragher from a utility player to one of Europe's top centre backs alongside Sami Hyypiä. During his first season, Benítez was unable to improve Liverpool's form in the Premiership. Key players missed much of the season through injury and Liverpool failed to challenge Chelsea and Arsenal for the league title, finishing fifth. Benítez, however, did reach his first English domestic cup final, losing the League Cup final against Chelsea at the Millennium Stadium 3–2 after extra time. In the Champions League, however, Liverpool fared differently, despite their poor start. Liverpool began their campaign with an unimpressive 2–1 aggregate win over Grazer AK in the qualifying rounds and were minutes away from going out of the competition in the group stages. However, an 87th-minute goal by Steven Gerrard defeated Olympiacos 3–1 and saw the club progress to the last 16 on head-to-head difference. After defeating Bayer Leverkusen and Juventus with the aid of some bold team selections by Benítez, Liverpool faced Chelsea in the semi-final. A controversial early goal from Luis García saw Liverpool win 1–0 on aggregate and reach the final against Milan. In a classic final, Liverpool came from 3–0 down at half time to level the score at 3–3 in the space of just six minutes, eventually triumphing 3–2 on penalties with the assistance of goalkeeper Jerzy Dudek. Benítez's calm, methodical approach at half time was said to give the players the belief they could pull off an improbable comeback and win Liverpool an historic fifth European Cup. In doing so, Benítez became only the third manager in history (after Bob Paisley and José Mourinho) to win the UEFA Cup and UEFA Champions League in successive seasons, and the second Liverpool manager (after Joe Fagan) ever to win the European Cup/UEFA Champions League in his first season in charge. Benítez's tactics were credited as a key factor in Liverpool reaching, and winning, the final, despite a relatively unimpressive squad of players. Dudek's heroics in the final were not enough for him to stay as first-choice keeper, as newly signed Pepe Reina replaced him in from the start of the 2005–06 season. Benítez also quickly discarded Vladimír Šmicer and Igor Bišćan, who played key roles in the European success but seemingly did not figure in Benítez's long-term plans. Benítez also quickly sold Josemi and Antonio Núñez, two of his first signings in English football, after they failed to establish themselves, with the likes of Peter Crouch, Mohamed Sissoko, Daniel Agger as well as former Liverpool player Robbie Fowler being brought in to strengthen the side. Benítez's signings helped the club's Premiership form improve considerably. Liverpool finished third in the league, missing out on second place by one point. Liverpool also won the FA Cup beating both Manchester United and Chelsea, as well as a thrilling 5–3 win against Luton Town in the third round, on the way to the final against West Ham United. History repeated itself in the final as they then went on to lift the trophy after a penalty shoot-out, following a dramatic 3–3 draw. Liverpool came from 2–0 down and were losing 3–2 in stoppage time when Steven Gerrard scored a dramatic late equalizer. This time, Pepe Reina saved three penalties during the shoot-out to secure the silverware. Following Benítez's great early success, the English media were predicting Liverpool would challenge Chelsea for the 2006–07 Premier League title after Benítez addressed Liverpool's perceived weaknesses in the transfer window, a belief reaffirmed after his side won the Community Shield with a 2–1 victory over Chelsea. The title challenge, however, fizzled out early in the season, with Liverpool's poor form away from Anfield leading to speculation Benítez's tenure at Liverpool was short-lived, with his agent quoted as saying Benítez would consider offers to manage in Italy. Benítez swiftly issued a statement through the club's website re-affirming his desire to remain with Liverpool for the long-term. In January, Benítez's side lost twice in four days to Arsenal in both domestic cup competitions, including a 6–3 defeat in the League Cup that was Liverpool's heaviest home defeat since 1913. Despite the poor domestic performances, Liverpool fans remained supportive of Benítez. Supporters and manager joined together to welcome new owners George Gillett and Tom Hicks, with the hope the new owners would bring funding for new players and a new stadium. Gillett declared himself delighted with the manager of his new investment, as Benítez overcame his domestic difficulties to lead Liverpool to another Champions League final. After Liverpool again defeated Chelsea in the semi-final, this time on penalties, Gillett stated, "Rafa has been tremendous ... We knew of him but I don't think we realized how good he was, and not just as a coach. Not only was he a brilliant coach but he is a very sharp, savvy businessman. He knows what he wants and how to get it. The more we have seen of him the more impressed we have become." Benítez did not reciprocate his owner's kind words, demanding his club's new owners had to back him in the transfer market in order for Liverpool to progress following his side's 2–1 loss to Milan in the final. It was reported Benítez did not feel he had the complete support of the new owners, a thought that was compounded by Liverpool's initial lack of activity in the transfer window, although the club played these rumours down. Benítez's spending was, eventually, significant, breaking Liverpool's transfer record when signing Spanish striker Fernando Torres from Atlético Madrid as well as signing Ryan Babel, Yossi Benayoun, Lucas Leiva and Andriy Voronin. Among those Benítez sold was Craig Bellamy, who was notably phased out of the first team following an altercation with John Arne Riise in the buildup to Liverpool's remarkable victory over Barcelona in the Camp Nou en route to the Champions League final. Liverpool made a good start to the 2007–08 season, topping the Premier League table for the first time under Benítez after a comprehensive 6–0 win over Derby County. Despite this, poor results in the Champions League and a disagreement over future transfers lead to a public falling-out with the club's owners, which played out in the media at the end of November. It was suggested that Benítez's position was now under serious threat. The resulting coverage resulted in a show of support by fans in support of Benítez which culminated in a fans' march in support of Benítez ahead of the critical Champions League home tie with Porto, which they won 4–1. It later emerged that Jürgen Klinsmann had been offered Benítez's job before eventually accepting the post of Bayern Munich manager. Such a revelation damaged Benítez's relations with the Americans, with constant rumours linking the Spaniard with a move back to Real Madrid. Benítez, however, insisted his future was at Liverpool and signalled his long-term intentions by appointing Sammy Lee as his new assistant to replace his long-time right-hand man, Pako Ayestarán, who quit after a reported disagreement, which Benítez admitted "hurt" him and arguably Liverpool's titles hopes. Benítez was unable to win any trophies as Liverpool's domestic campaign falter in the winter months – including a shock FA Cup exit at home to Barnsley, with his side losing to Chelsea in the Champions League semi-finals. Despite the lack of silverware, the main talking points were off the pitch, with Benítez in the middle of a power struggle with the Liverpool board. In a sign of the increasingly strained relationship between the Liverpool manager and his board, Benítez was reportedly close to quitting Liverpool in the summer of 2008 over the Liverpool board's failure to back him in his bid to purchase Gareth Barry from Aston Villa. Benítez had reportedly intended to sell Xabi Alonso to fund the purchase of Barry, but Liverpool CEO Rick Parry was reported to have prioritised signing Robbie Keane over Barry, causing tension when Barry did not arrive. Striker Keane was later re-sold back to Tottenham Hotspur in the January transfer window, with some analysts claiming he was a "pawn in a power struggle" between Benítez and the club's owners. This off-field turmoil was in contrast to Liverpool's impressive start to the 2008–09 season in the Premier League, including Benítez' first ever league win against Manchester United at Anfield on 13 September and ending Chelsea's 86 match unbeaten run in the league at Stamford Bridge. Liverpool finished the calendar year top of the Premier League for the first time since 1996. However, Liverpool's poor results in the New Year led to a sharper focus on Benítez, who had missed Liverpool's draw at Arsenal in December due to an operation to remove kidney stones. An infamous attack on Manchester United manager Sir Alex Ferguson in the media led some pundits and opposition supporters to suggest Benítez was "cracking up" under the pressure of a title bid. Benítez still appeared to be at odds with Liverpool's owners, publicly turning down a contract extension and demanding more control over transfers. At one point, rumours of Benítez quitting or being dismissed became so great that bookmakers had to suspend betting on the subject. 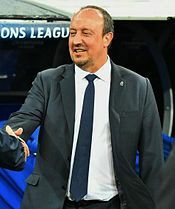 Nevertheless, on 18 March 2009, shortly after registering a 4–0 victory over Real Madrid and 4–1 victory over Manchester United, Benítez signed a new five-year deal with the club. Benítez said, "My heart is with Liverpool, so I'm delighted to sign this new deal, I love the club, the fans and the city and with a club and supporters like this, I could never say no to staying." With ten wins in their last 11 games, Liverpool finished the season on a high, finishing second in the league for the first time under Benítez, four points off champions Manchester United, with Liverpool playing an attractive brand of attacking football at odds with the side that struggled through the winter months. Prior to Benítez's final season at Liverpool, Xabi Alonso, one of the key members of Benítez's squad, was sold to Real Madrid following a lengthy pursuit in a deal reportedly worth £30 million. Alonso said that Benítez's attempts to sell him the previous summer were a deciding factor in his move. Alonso was immediately replaced in the squad by Italian midfielder Alberto Aquilani, signed from Roma for £17 million, who was recovering from a long-term injury. Also added was England defender Glen Johnson for a £17.5 million fee. A "sell to buy" policy enforced by the ownership due to increasing debt, combined with Alonso's departure, prompted discontent amongst considerable sections of the club's fanbase who believed Benítez was not being backed sufficiently in the transfer market. Benítez's decision to sell Alonso and replace him in the side with Lucas Leiva, in addition to Aquilani having arrived at the club injured, was called into question as Liverpool's title campaign began with two defeats in the first three games. Benítez defended his decisions, arguing Liverpool's slow start was due to key players such as Steven Gerrard being below par. Liverpool's worst run in 22 years combined with an exit from the Champions League at the group stages led to the first major vocal criticism of Benítez by Liverpool fans. It was suggested that this Liverpool team was missing Benítez's characteristic defensive rigidity despite the fact that only Manchester United and Chelsea conceded fewer goals than Liverpool, and lacked the necessary depth to cope with injuries to key players such as Gerrard and Fernando Torres while Benítez's decision making was called into question. The club subsequently exited the UEFA Europa League at the hands of Atlético Madrid, eliminating any hope of a trophy. Benítez left the club "by mutual consent" on 3 June 2010 with a reported £6 million pay-off; the media speculated that this was because the team had finished seventh in the Premier League, missing out on the Champions League, and suffered poor results, including the defeat by Wigan Athletic. Shortly after his departure from Anfield, Benítez made a £96,000 donation to the Hillsborough Family Support Group. On 10 June 2010, and only a few days after leaving Liverpool, Benítez agreed a deal to become the new head coach of Serie A and reigning Champions League title-holders Inter Milan, a post that was left vacant by the departure of José Mourinho, who left to manage Real Madrid. On 15 June 2010, Benítez was presented to the Italian media for the first time after signing a two-year deal. On 21 August 2010, Benítez won his first trophy as manager, the Italian Super Cup, after they defeated Roma 3–1. On 27 August 2010 in Monaco, Inter lost to Atlético Madrid in the 2010 UEFA Super Cup. Benítez's first Serie A game in charge was on 31 August 2010 in a 0–0 draw away to Bologna in the Stadio Renato Dall'Ara. His first league win as manager came on 11 September 2010, a 2–1 win against Udinese at the San Siro. By December 2010, Inter had slumped to sixth in Serie A, 13 points adrift of the top (although Inter played two games less), having suffered consecutive defeats against arch rivals Milan (which ended a 46 match unbeaten home record), Chievo and Lazio, as well as losing at Tottenham Hotspur in the Champions League, leading to speculation that Benítez's position was under threat. Despite criticism, Benítez guided Inter to win the FIFA Club World Cup in December 2010. Buoyed by the Club World Cup victory, he told the European champions to back him with new signings or consider whether they wanted to keep him as coach, despite the side having won the treble only a few months earlier. Benítez's demands were dismissed out of hand by the Inter ownership, with Massimo Moratti refusing to comment on Benítez's continued employment by the club. On 23 December 2010, Benítez was dismissed by Inter. On 21 November 2012, following the dismissal of Roberto Di Matteo, Chelsea appointed Benítez as interim first-team manager until the end of the 2012–13 season. He was unveiled as the new Chelsea manager at a press conference on 22 November 2012. He appointed Boudewijn Zenden as his new assistant manager at Chelsea on the same day. The appointment was unpopular with many Chelsea fans due to Benítez' association with Liverpool and comments he had previously made about the club, and he received a "fiercely hostile reception" as he was introduced at his first home game, a 0–0 draw with Manchester City on 25 November 2012. This was followed by a 0–0 draw at home to Fulham and a 3–1 loss to West Ham. On 5 December 2012, Benítez recorded his first win as Chelsea manager, a 6–1 victory at home to Nordsjælland in the Champions League. Despite this win, Chelsea failed to progress beyond the group stage of the competition. This was followed by a 3–1 away victory to Sunderland, with Benítez presiding over his first league win as Chelsea manager. At the FIFA Club World Cup in December 2012, Chelsea defeated Monterrey 3–1 to reach the final, where they were beaten 1–0 by Brazilian side Corinthians. Chelsea progressed to the League Cup semi-finals with a 5–1 win over Leeds United at Elland Road and then recorded an 8–0 win over Aston Villa, equalling their record top-flight victory. They subsequently lost 1–0 at home to 20th-placed Queens Park Rangers in the Premier League and were knocked out of the League Cup semi-finals by underdogs Swansea City 2–0 on aggregate. On 27 February 2013, following a 2–0 win at Middlesbrough in the FA Cup fifth-round, Benítez heavily criticised the Chelsea board for giving him the title of "interim manager" and the Chelsea fans for their protests against him. He also confirmed that he would be leaving the club at the end of the season. He described his relationship with Chelsea owner Roman Abramovich as "excellent" and expressed his desire to remain as Chelsea manager until the end of the season. Results continued to be mixed, and at one point Chelsea found themselves 16 points behind league leaders Manchester United, having been just four behind when Benítez was appointed. Chelsea reached the semi-finals of the FA Cup, losing 2–1 to Manchester City at Wembley Stadium, and also progressed to the final of the UEFA Europa League. In the penultimate league game of the season, Chelsea won 2–1 away to Aston Villa, a game in which Frank Lampard set the all-time scoring record at Chelsea. The win secured a top-four Premiership finish and with it a place in the following season's Champions League. In the Europa League Final against Benfica on 15 May, Chelsea won 2–1. This made Benítez only the second manager after Giovanni Trapattoni to have won the UEFA Cup/Europa League with two different teams, and Chelsea became the fourth club to have won all three of UEFA's major club competitions. Defender David Luiz credited Benítez with making critical changes at half time, saying, "He changed some of our positions in the second half. That's why we played better and won the title. He spoke a lot to us to change the intensity." On the winning goal scored by Branislav Ivanović, Juan Mata said, "Rafa told us we had to aim to the far post, because it was Artur's weakest place. I just tried to put the ball there and Ivanovic did the rest." On 19 May, in his final competitive game as Chelsea manager, Benítez managed the team to a 2–1 home win over Everton, ensuring a third-place finish in the Premier League and a direct spot in the following season's Champions League group stage. On 27 May 2013, it was announced that Benítez had signed for Napoli, whose manager Walter Mazzarri had resigned. Benítez agreed a two-year contract after meeting club president Aurelio De Laurentiis in London. In his first season in charge, Benítez guided the club to victory in the Coppa Italia, defeating Fiorentina 3–1 in the final, and into the last 16 of the Europa League, exiting after a 3–2 aggregate defeat to Porto. Napoli finished third in Serie A in 2013–14 to qualify for the next season's Champions League. They lost 4–2 on aggregate to Athletic Bilbao in the qualifying stages, thus entering the Europa League. Benítez announced that he would resign at the end of the 2014–15 season. His final match was a 4–2 defeat to Lazio, who took the final place in the Champions League at Napoli's expense. On 3 June 2015, Benítez was confirmed as the new Real Madrid manager, signing a three-year contract. Real Madrid remained unbeaten in the league until a 3–2 loss at Sevilla in the 11th matchday. This was followed by a 4–0 home loss in the first Clásico of the season against Barcelona. Real later played Cádiz in the Copa del Rey Round of 32, winning away 3–1 in the first leg. However, they fielded an ineligible player in Denis Cheryshev as he was suspended for that match, resulting in the second leg being cancelled and Madrid being disqualified. Meanwhile, Real topped their UEFA Champions League group with 16 points. On 4 January 2016, Benítez's contract was terminated following allegations of unpopularity with supporters, displeasure with players and a failure to get good results against top sides. At the time of his dismissal, Real were third in La Liga, four points behind leaders Atlético Madrid and two points behind arch-rivals Barcelona, the latter of whom had a game in hand. On 11 March 2016, Benítez was appointed as the manager of relegation threatened Newcastle United, signing on an initial three-year deal. He suffered defeat in his first match in charge, losing 1–0 away to eventual champions Leicester City on 14 March. Benítez would have to wait until 16 April for his first win in charge of The Magpies, recording a convincing 3–0 victory over Swansea City in the Premier League. Newcastle ended the season with a six match unbeaten run, including a 5–1 final day win over third-place Tottenham Hotspur. However, the team was relegated to the Championship due to rivals Sunderland claiming 12 points from their final six fixtures. On 25 May 2016, it was confirmed he would remain as manager. In May 2017, Newcastle won the 2016–17 EFL Championship and made an immediate return to the Premier League after one season in the Championship. Benítez has had confrontations with both José Mourinho (Chelsea manager from 2004–2007) and Manchester United's Sir Alex Ferguson during his time in English football. Benítez made a number of suggestions during Mourinho's tenure as manager that Roman Abramovich's money had bought Chelsea's success, and the pair refused to shake hands after some matches (although Mourinho declared the feud to be over after a league game in 2006). When Mourinho exited Chelsea in 2007, Benítez said, "You know my relationship with him, it is better that I do not say anything," declining to comment as Ferguson and Arsenal manager Arsène Wenger had. On 9 January 2009, Benítez delivered a controversial appraisal of certain aspects of Sir Alex Ferguson's tenure, accusing Ferguson and Manchester United of being nervous because Liverpool were at the top of the league, then accused the Manchester United manager of not being punished for breaking FA rules, suggesting he was "the only manager in the league that cannot be punished for these things", referring to Ferguson not being punished following an FA charge for comments he made about officials Martin Atkinson and Keith Hackett following an FA Cup tie with Portsmouth. In his 2013 autobiography, Ferguson said that "Benitez bought badly and made the feud personal". Benítez has also had confrontations with Sam Allardyce when he was manager of Newcastle United and Blackburn Rovers. When Allardyce was manager of Newcastle, he suggested Benítez would have been dismissed had Liverpool's European form been as bad as their league form. In a match in April 2009 when Allardyce was manager of Blackburn, he accused Benítez of arrogance over a gesture he made when Fernando Torres scored Liverpool's second goal. Allardyce suggested that Benítez had signalled the game was over despite Liverpool only having a two-goal lead. This view was later supported by Sir Alex Ferguson. Benítez, however, later explained this gesture: he said he had previously told Xabi Alonso to take a short free-kick. This instruction was ignored, which resulted in a goal. Benítez said that he had jokingly signalled to Alonso to ignore his instructions and not that he thought the game was effectively over. Benítez has developed a reputation in English football as a hard man to please, with former Liverpool captain Steven Gerrard admitting he longed for a "well done" from Benítez after good performances. Benítez's ruthlessness can also be seen in the way he disposed of all but Gerrard and Jamie Carragher from his Champions League winning squad within four seasons, with penalty shoot-out hero Jerzy Dudek made back-up goalkeeper the very season after the European triumph. Benítez's preferred formation is a 4–2–3–1 which he adopted during his time at Valencia and Liverpool. He has often been praised[by whom?] for his tactical acumen particularly in European ties, setting his team up to exploit opposition weaknesses. His calm demeanour and tactical changes at half time of the 2005 UEFA Champions League Final were said to give players belief they could battle back from 3–0 down, although he had to correct his plans when it was pointed out to him his new formation would require 12 players on the pitch. Benítez often plays key players in unorthodox positions to suit a formation – notably converting both Steven Gerrard (in the 2005–06 season) and Dirk Kuyt into right-wingers. As a right winger/midfielder, Steven Gerrard had the most productive seasons winning wise, claiming a Champions League title, and an FA Cup. Benítez is a firm believer in squad rotation and zonal marking. Despite heavy criticism from the English press Benítez persisted with the reward of a Champions League and FA Cup triumph in his first two seasons. Benítez argued he needed to rotate his small squad to ensure key players were fit for the latter stages of these knockout competitions. The tactic of zonal marking has been criticised by pundits when Liverpool concede from set-pieces in spite of the fact that Benítez's squads are usually renowned for their defensive nature and low number of goals scored against them. Benítez stands by his tactic, pointing out that teams who man-mark concede just as many, if not more, goals from set pieces. Benítez instigated a host of backroom changes at the end of the 2008–09 season to improve the club's youth development, including the appointment of club legend Kenny Dalglish in a senior role at the academy. Benítez's father, Francisco, worked as a hotelier. His mother is Rosario Maudes. Rosario was a big football fan and supported Real Madrid, while his father supported Atlético Madrid. Francisco died in December 2005 while Benítez was in Japan for the FIFA Club World Championship. Rafael Benítez married Maria Montserrat in 1998. They have two daughters, Claudia, who was born in Madrid in 1999, and Ágata who was born in Valencia in 2002. Benítez is fluent in Spanish, English and Italian. ^ In isolation, Benítez is pronounced [beˈniteθ]. ^ a b c "Benítez: Rafael Benítez Maudes: Manager". BDFutbol. Retrieved 3 May 2018. ^ "Rafael Benítez: Biography". IMDb. Retrieved 3 May 2018. ^ McCourt, Ian (7 May 2015). "Napoli's Rafa Benítez has his eyes on another final in Europa League". The Guardian. Retrieved 21 September 2015. ^ "Todo empezó con el sofá y la lámpara" [Everything started with the sofa and the lamp]. Las Provincias (in Spanish). 4 June 2007. ^ a b "Benitez quits Valencia". BBC Sport. 1 June 2004. Retrieved 1 April 2017. ^ "Liverpool appoint Benitez". BBC Sport. 16 June 2004. ^ Dominic Fifield (29 June 2004). "Benítez boost as Gerrard stays at Liverpool". The Guardian. London. Retrieved 26 April 2010. ^ Rob Smyth (7 March 2007). "Is Jamie Carragher England's best defender?". The Guardian. London. Retrieved 26 April 2010. ^ Lipton, Martin (9 November 2005). "Benitez Uncovered: Inside The Dressing Room On That Amazing Night In Istanbul". Daily Mirror. Retrieved 26 April 2010. ^ "This team is my best ever, says Liverpool boss Benitez". Daily Mail. London. 22 April 2008. Retrieved 26 April 2010. ^ "LFC v Milan 2005: A text commentary". Liverpool F.C. 25 May 2015. Retrieved 26 May 2015. ^ "Liverpool dismiss Benitez report". BBC Sport. 9 November 2006. Retrieved 7 November 2008. ^ "Rafa: My agent was misquoted". Liverpool F.C. 11 November 2006. Archived from the original on 14 December 2007. Retrieved 7 November 2008. ^ "Gillett Blown Away By Rafa Brilliance". Liverpool F.C. Archived from the original on 2 April 2015. ^ "We must spend big, says Benitez". BBC Sport. 24 May 2007. Retrieved 7 November 2008. ^ "Parry plays down Benitez reports". BBC Sport. 27 May 2007. Retrieved 7 November 2008. ^ Taylor, Louise (19 February 2007). "Bellamy faces uncertain future as Liverpool reel from golf club attack". The Guardian. London. Retrieved 22 February 2007. ^ Kay, Oliver (28 November 2007). "Rafael Bentez calls temporary truce as fans plan show of solidarity". The Times. London. Archived from the original on 4 June 2011. Retrieved 22 May 2010. ^ "ESPNFC: Soccer The long goodbye for Rafa?". ESPN FC. ^ "Sammy Lee back as Liverpool assistant coach". The Daily Telegraph. London. 16 May 2008. Retrieved 26 April 2010. ^ "Pako betrayed me and it still hurts – Benitez lifts the lid on his assistant's Anfield exit". Daily Mail. London. 31 March 2008. Retrieved 26 April 2010. ^ "Benitez urges his squad to focus". BBC Sport. 12 April 2008. Retrieved 26 April 2010. ^ Edwards, John (16 August 2008). "Furious Benitez threatens to quit Anfield over Barry bid fiasco". Daily Mail. London. Retrieved 9 January 2009. ^ Maddock, David (22 August 2008). "Liverpool boss Rafa Benitez and chief exec Rick Parry call a truce". Daily Mirror. Retrieved 4 March 2009. ^ Reade, Brian (31 January 2009). "Never Walk Alone? Liverpool chiefs are pulling in different directions". Daily Mirror. Retrieved 4 March 2009. ^ "Liverpool brand Benítez exit talk as "ridiculous"". ESPN Soccernet. 25 February 2009. Retrieved 25 February 2009. ^ "Benitez signs long-term Reds deal". BBC Sport. 18 March 2009. Retrieved 18 March 2009. ^ Smith, Rory (23 February 2009). "Liverpool have six games to save their season". The Daily Telegraph. London. Retrieved 1 August 2014. ^ Smith, Rory (5 August 2009). "Xabi Alonso completes Real Madrid Move". The Daily Telegraph. London. Retrieved 1 August 2014. ^ "Xabi Alonso: I decided to leave Liverpool FC after club's move for Gareth Barry". Liverpool Echo. Retrieved 26 April 2010. ^ "John Aldridge: Funding woe sure to frustrate Rafa Benitez". Liverpool Echo. 22 August 2009. Retrieved 26 April 2010. ^ Smith, Rory (26 August 2009). "Five key areas for Liverpool manager Rafael Benitez to address". The Daily Telegraph. London. Retrieved 1 August 2014. ^ "Gerrard below par, says Benitez". BBC Sport. 28 August 2009. Retrieved 26 April 2010. ^ McNulty, Phil (20 October 2009). "Liverpool 1–2 Lyon". BBC Sport. Retrieved 26 April 2010. ^ McNulty, Phil (21 October 2009). "Phil McNulty: Benitez faces biggest test". BBC. Retrieved 26 April 2010. ^ English Angle (30 September 2009). "Liverpool Comment: Jovetic Shows Genius, But Rafa's Rigid Defence Is Falling Apart". Goal.com. Retrieved 26 April 2010. ^ Dominic King. "Rafa Benitez's days are numbered insists legend Ronnie Whelan". Liverpool Echo. Retrieved 26 April 2010. ^ Ashdown, Josh (3 May 2010). "Rafael Benítez leaves Liverpool". The Guardian. London. ^ "Spaniard departs Anfield after six years at the helm". Sky Sports. 3 June 2010. Retrieved 3 June 2010. ^ "Rafael Benitez makes donation to Hillsborough families". BBC Sport. 10 June 2010. Retrieved 15 April 2019. ^ "Rafael Benitez, welcome to Inter!". FC Internazionale Milano. 10 June 2010. Retrieved 13 June 2010. ^ "Rafael Benitez targets success at new club Inter Milan". BBC Sport. 15 June 2010. Retrieved 15 June 2010. ^ "Benitez begins Inter reign with Supercoppa triumph". ESPN Soccernet. 21 August 2010. Retrieved 23 August 2010. ^ "Rafa's reign off to slow start". ESPN Soccernet. 27 August 2010. Archived from the original on 1 September 2010. Retrieved 30 September 2010. ^ "Champions held in opener". ESPN Soccernet. 31 August 2010. Archived from the original on 23 October 2012. Retrieved 30 September 2010. ^ "Eto'o fires Inter top". ESPN Soccernet. 11 September 2010. Archived from the original on 23 October 2012. Retrieved 30 September 2010. ^ "The end of Inter Milan 1–0 Ibrahimovic unbeaten 46 points to kill". suyuebing1212. 15 November 2010. Archived from the original on 14 July 2011. Retrieved 1 August 2014. ^ "Inter Milan line up Capello to replace under-fire Benitez". talkSPORT. ^ "TP Mazembe 0 – 3 Internazionale". ESPN Soccernet. 18 December 2010. Archived from the original on 22 December 2010. Retrieved 18 December 2010. ^ "Benitez issues quit threat to Inter". RTÉ Sport. 19 December 2010. Archived from the original on 22 December 2010. Retrieved 19 December 2010. ^ "Massimo Moratti refuses to comment on Rafael Benítez's future". The Guardian. London. 20 December 2010. ^ "Inter Milan sack manager Rafael Benetiz". BBC Sport. 23 December 2010. Retrieved 23 December 2010. ^ "BENITEZ APPOINTED". Chelsea official website. 21 November 2012. Archived from the original on 8 August 2014. Retrieved 1 August 2014. ^ "Chelsea bring in Benítez for rest of season". UEFA. 21 November 2012. Retrieved 21 November 2012. ^ "Rafael Benitez set to be presented as Chelsea manager". BBC Sport. 22 November 2012. Retrieved 22 November 2012. ^ Kelso, Paul; Burt, Jason (22 November 2012). "Chelsea owner Roman Abramovich takes gamble on Rafael Benitez after Pep Guardiola's refusal". The Daily Telegraph. London. Retrieved 22 November 2012. ^ Ronay, Barney (22 November 2012). "Welcome Mr Benítez, Chelsea's latest second-best next big thing". The Guardian. London. Retrieved 23 November 2012. ^ Fanning, Evan; Gibbs, Thom (22 November 2012). "Rafa Benítez unveiled as new Chelsea manager: live". The Daily Telegraph. London. Retrieved 23 November 2012. ^ "Rafael Benitez to Chelsea: Full reaction and analysis". BBC Sport. 22 November 2012. Retrieved 23 November 2012. ^ Ashton, Neil (22 November 2012). "Rafa 1 Roman 0: Benitez forces Abramovich to bring in Zenden as his No 2... and he brings in another goalkeeping coach". Daily Mail. London. Retrieved 23 November 2012. ^ Crooks, Eleanor (26 November 2012). "Chelsea fans call for Rafael Benitez apology". The Independent. London. Retrieved 14 January 2013. ^ "Chelsea 0–0 Manchester City". BBC Sport. 25 November 2012. Retrieved 25 November 2012. ^ "Chelsea: Rafael Benitez boos will continue say fans". BBC Sport. 26 November 2012. Retrieved 26 November 2012. ^ "Chelsea 0–0 Fulham". BBC Sport. 28 November 2012. Retrieved 24 March 2014. ^ "West Ham 3–1 Chelsea". BBC Sport. 1 December 2012. Retrieved 24 March 2014. ^ "Chelsea 6–1 Nordsjaelland". BBC Sport. 5 December 2012. Retrieved 5 December 2012. ^ "Fernando Torres scored twice as Chelsea secured a first Premier League win in eight games and ensured Sunderland dropped into the relegation zone". BBC Sport. 8 December 2012. Retrieved 9 December 2012. ^ "Monterrey 1–3 Chelsea". BBC Sport. 13 December 2012. ^ "Corinthians 1–0 Chelsea". BBC Sport. 16 December 2012. ^ "Chelsea 8–0 Aston Villa". BBC Sport. 23 December 2012. ^ "Chelsea 0–1 QPR". BBC Sport. 2 January 2013. ^ "Swansea 0–0 Chelsea". BBC Sport. 23 January 2013. ^ Taylor, Louise (27 February 2013). "Rafael Benítez fires broadside at Chelsea fans and the board". The Guardian. Guardian Sport. London. ^ "Rafael Benitez wants to stay at Chelsea until end of the season". BBC Sport. 28 February 2013. ^ "Tarnished Times Down at Chelsea". The Wall Street Journal. 14 May 2013. ^ "Lampard: Goals record for my mum". ESPNFC. 11 May 2013. ^ "Ivanović heads Chelsea to Europa League glory". UEFA. 15 May 2013. ^ "Chelsea in league of their own after unlikely European double". The Times. London. 15 May 2013. ^ Taylor, Daniel (15 May 2013). "Chelsea's Branislav Ivanovic climbs highest to sink Benfica". The Guardian. London. Retrieved 21 May 2013. ^ Fifield, Dominic (19 May 2013). "Chelsea grateful to long-overdue Torres as Everton are finally seen off". The Guardian. London. ^ a b c "Benitez è il nuovo allenatore del Napoli". S.S.C. Napoli. 27 May 2013. Retrieved 10 January 2014. ^ Jones, Simon (28 May 2013). "Napoli president unveils Benitez as new manager as Chelsea time comes to an end". Daily Mail. London. Retrieved 6 June 2013. ^ "Rafael Benítez: Napoli appoint Spaniard as manager". BBC Sport. 28 May 2013. Retrieved 6 June 2013. ^ "Coppa Italia final: Rafael Benitez's Napoli beat Fiorentina 3–1". BBC Sport. ^ "Porto end Rafael Benitez's hopes of retaining Europa League title". BBC Sport. ^ "Napoli League Table 2013–14". Statto Organisation. Archived from the original on 4 March 2016. Retrieved 18 May 2015. ^ "Champions League 2014–15 play-off draw: as it happened". The Daily Telegraph. Retrieved 18 May 2015. ^ "Bilbao end Napoli's Champions League dream; Ludogorets win PK thriller". Fox Sports. Retrieved 18 May 2015. ^ "Serie A Review: Napoli miss Champions League in Benitez send-off". FourFourTwo. 31 May 2015. Retrieved 3 June 2015. 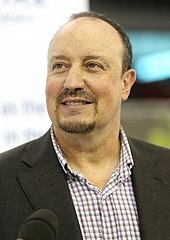 ^ "Official announcement: Rafa Benítez". Real Madrid C.F. 3 June 2015. ^ "Rafa Benitez named new coach of Real Madrid". Sky Sports. 3 June 2015. Retrieved 3 June 2015. .
^ "Zidane: a club legend in the Real Madrid dugout". Real Madrid C.F. 4 January 2016. Retrieved 4 January 2016. ^ "Rafael Benítez sacked by Real Madrid with Zinedine Zidane taking over". The Guardian. 4 January 2016. Retrieved 5 January 2016. ^ "Rafa Benitez Confirmed As Newcastle Manager". Newcastle United F.C. 11 March 2016. ^ "Rafael Benitez: Newcastle United appoint Spaniard as Steve McClaren's successor". BBC Sport. 11 March 2016. ^ "Rafa Benitez remaining positive after loss on Newcastle debut". ESPN FC. 14 March 2016. Retrieved 15 March 2016. ^ Bird, Simon (16 April 2016). "Newcastle 3–0 Swansea: Rafa Benitez wins first game at fifth attempt". Daily Mirror. Retrieved 17 April 2016. ^ "Newcastle 5–1 Tottenham". BBC Sport. 15 May 2016. ^ "Sunderland 3–0 Everton – BBC Sport". BBC Sport. 11 May 2016. ^ "Rafael Benitez stays as Newcastle United manager – BBC Sport". BBC Sport. 25 May 2016. ^ "Newcastle crowned Championship winners after late Jack Grealish Aston Villa equaliser halts Brighton". The Telegraph. 5 May 2017. Retrieved 27 July 2017. ^ "Mourinho accepts Ballack red card". BBC Sport. 17 September 2006. Retrieved 9 January 2009. ^ "Ferguson pays tribute to Mourinho". BBC Sport. 27 September 2007. Retrieved 9 January 2009. ^ a b "The full transcript of Rafael Benítez's rant at Sir Alex Ferguson". The Guardian. London. Retrieved 1 August 2014. ^ Bandini, Paolo (9 March 2008). "FA will review Ferguson's criticisms of Atkinson and Hackett". The Guardian. London. Retrieved 18 March 2009. ^ Ladyman, Ian; Lawton, Matt (22 October 2013). "FERGIE'S EXPLOSIVE NEW BOOK". Daily Mail. London. Retrieved 22 October 2013. ^ Prentice, David (18 September 2007). "John Aldridge slams Newcastle boss Sam Allardyce after Rafa Benitez attack". Liverpool Echo. ^ "Blackburn boss Sam Allardyce steps up Benitez criticism". BBC Sport. 11 March 2010. Retrieved 30 September 2010. ^ Smith, Rory (7 May 2009). "Steven Gerrard lavishes praise on Rafael Benitez's 'winning mentality'". The Daily Telegraph. London. Retrieved 1 August 2014. ^ "Was Rafa Benitez right to sell all but TWO of Liverpool's 2005 Champions League winning squad?". Daily Mirror. Archived from the original on 10 October 2012. Retrieved 26 April 2010. ^ Prentice, David (19 September 2008). "Why Liverpool's Rafa Benitez is a master tactician". Liverpool Echo. ^ Shaw, Phil (11 March 2005). "Carragher hails tactician Benitez". The Independent. London. Retrieved 26 April 2010. ^ Winter, Henry (7 July 2007). "Gerrard: Benitez made mistakes". The Daily Telegraph. London. Retrieved 26 April 2010. ^ Barrett, Tony. "Jamie Carragher: What really happened at half-time in Istanbul". Liverpool Echo. Retrieved 26 April 2010. ^ Williams, Richard (26 September 2006). "The cult of permanent rotation blights Benítez's bid for title". The Guardian. London. Retrieved 26 April 2010. ^ "Benitez opens doors to rotation". FIFA. 30 October 2008. Retrieved 26 April 2010. ^ Howe, Don (9 April 2009). "Liverpool's demise against Chelsea the fault of Rafael Benitez's zonal marking". The Daily Telegraph. London. Retrieved 1 August 2014. ^ Redknapp, Jamie (31 August 2009). "Rafa Benitez must sort Liverpool out". Daily Mail. London. Retrieved 26 April 2010. ^ "RTÉ Sport: Benitez stands by zonal marking". Raidió Teilifís Éireann. 14 April 2009. Archived from the original on 5 June 2011. Retrieved 26 April 2010. ^ Prentice, David. "Kenny Dalglish rejoins Liverpool FC". Liverpool Echo. Retrieved 26 April 2010. ^ "¿Quien es la mujer de Rafa Benítez?". 4 June 2015. ^ Región, La. "Montserrat Seara: "En nuestra primera cita Rafa me explicó el 4-4-2"". La Región. ^ Hunter, Andy (25 January 2010). "Juventus seeking to prise Rafael Benítez away from Liverpool". The Guardian. London. Retrieved 2 May 2010. ^ "Managers list of Madrid B: All". BDFutbol. Retrieved 3 May 2018. ^ "Managers list of Valladolid: All". BDFutbol. Retrieved 3 May 2018. ^ "Managers list of Osasuna: All". BDFutbol. Retrieved 3 May 2018. ^ "Managers list of Extremadura: All". BDFutbol. Retrieved 3 May 2018. ^ "Managers list of Tenerife: All". BDFutbol. Retrieved 3 May 2018. ^ Davies, Christopher (19 May 2004). "Real education benefits Benitez". The Daily Telegraph. London. Retrieved 1 April 2017. ^ "Managers list of Valencia: All". BDFutbol. Retrieved 3 May 2018. ^ a b c d e f "Managers: Rafael Benitez". Soccerbase. Centurycomm. Retrieved 12 May 2018. ^ "Rafael Benitez replaces Roberto Di Matteo as Chelsea manager". BBC Sport. 21 November 2012. Retrieved 1 April 2017. ^ "Honours". Rafa Benitez. Retrieved 1 August 2017. ^ "Newcastle United 3–0 Barnsley". BBC Sport. 7 May 2017. Retrieved 9 May 2017. ^ "Manager profile: Rafael Benítez". Premier League. Retrieved 15 December 2018. ^ "Rafael Benitez named Sky Bet Championship Manager of the Month". English Football League. 11 November 2016. Retrieved 19 September 2018. Wikimedia Commons has media related to Rafael Benítez. "Rafael Benítez competition coaching record". UEFA. "2001–02 (ciberche.net)". Archived from the original on 2 March 2009. Retrieved 27 January 2007. "2002–03 (ciberche.net)". Archived from the original on 25 September 2009. Retrieved 27 January 2007. "2003–04 (ciberche.net)". Archived from the original on 1 November 2009. Retrieved 27 January 2007.